Its Active HDR technology and Dolby Vision support render the full image quality of 4K movies for an enriched viewing experience. This LG smart TV lets you stream favorite on-demand programs through its webOS 3.5 platform and via the LG Premium Channel Plus service. LG OLED pixels create their own light - and can switch off to achieve truly perfect black levels - providing the foundation for displaying the lush - vibrant color that this LG OLED TV delivers. 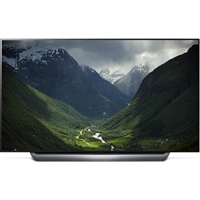 View content at four times the resolution of 1080p with the LG C8PUA-Series 65"-Class HDR UHD Smart OLED TV. It has a 64.5" OLED display for enhanced black levels and virtually infinite contrast. Being HDR10-, Dolby Vision-, and HLG-compatible, it can display a wider range of color with compatible content than non-HDR TVs; it also supports Advanced HDR playback via USB. The Best TV Ever just got even better with the new LG Oled-exclusive α9 intelligent processor, LG AI ThinQ, and 4K Cinema Hdr, plus Dolby Atmos audio. The Blade Slim design accentuates the LG Oled screen without distraction from the breathtaking picture. The awe-inspiring picture-on-glass design is made possible by a breakthrough approach to television engineering. The OLED module is applied directly to the glass back panel for a clean, ultra-slim profile. And the screen has a minimal bezel for minimal distraction. Experience enhanced cinematic viewing with the lifelike picture on this 65-inch LG Super UHD TV. Its a7 intelligent processor provides sharp, accurate images in 4K resolution, and its ThinQ artificial intelligence creates a central hub for your smart devices. LG ThinQ TVs become the hub for your connected smart devices. Beyond apps and entertainment, LG TV uses intelligent voice control to create a hub for the smart home and beyond. Imagine a television so carefully crafted with a timeless material, it even looks beautiful when turned off. This refined glass design celebrates the transcendent technology of LG OLED to create a captivating statement piece in your home. Discover an even clearer viewing experience with the a7 intelligent processor which reduces video noise, plus LG ThinQ AI, 4K Cinema HDR, and billion rich colors. A slender bezel accentuates the LG Super Ultra HD Nano Cell display, that improves color accuracy with its wider color gamut while absorbing unwanted light. Dolby Vision and Dolby Atmos support provides immersive picture and audio quality, and Nano Cell technology ensures color accuracy for lifelike image reproduction. The ThinQ AI system of this LG Nano 9 65-inch 4K HDR smart TV enables voice control via Google Assistant or Amazon Alexa. 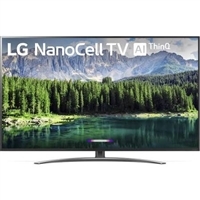 2160p (4K) resolution with HDRSmart TV, webOS, LG ThinQ AITruMotion 240 Marvel at lifelike movie scenes with this LG Nano 8 75-inch 4K HDR smart TV. The Nano Cell display provides accurate image details, and LG ThinQ AI technology works with voice commands via Google Assistant or Amazon Alexa. This LG Nano 8 75-inch 4K HDR smart TV supports Dolby Vision and Dolby Atmos formats for a cinematic experience. 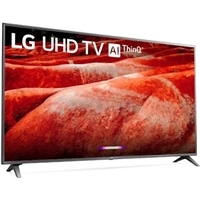 2160p (4K) resolution with HDRSmart TV, webOS, LG ThinQ AITruMotion 240 This LG 4K TV supports more premium content choices, all optimized with scene-by-scene picture adjustment, plus LG ThinQ AI, Wide Color Gamut, with a immersive rich Ultra Surround sound. A stylish Metal Frame that adds subtle touch of elegance to any. refresh rateSmart TV Color: Black. 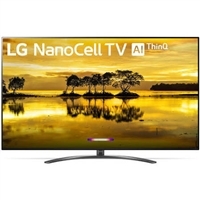 Bring the movie theater experience home with this 65" LG television. The A7 processor maximizes depth, sharpness and color to produce more lifelike images, and LG AI TV uses intelligent voice control to create a hub for the smart home and connected smart devices. wall-mounting or tabletop placement. Enjoy a more lifelike picture with the depth, sharpness and color of the a7 intelligent processor, plus LG ThinQ AI, 4K Cinema HDR with billion rich colors. The LG Super Ultra HD Nano Cell display improves color accuracy with its wider color gamut while absorbing unwanted light. The ultra-thin wallpaper design allows the television to mount virtually flush with the wall so it seems to blend in a feat only possible with uniquely sophisticated LG OLED TV technology. Your own theater awaits with an extra-large IPS 4K screen that provides four times the resolution of Full HD, even at wide viewing angles. Complete with the α7 Gen 2 Intelligent Processor — empowered by AI at its core to enhance images, action and color. Dolby’s image and sound technologies transform your experience. And it’s a brilliant TV that combines LG ThinQ with the voice assistance of the Google Assistant* and Alexa** to control your entertainment and smart home. Welcome home an LG UHD TV that pushes home cinema size to the extreme. Your own theater awaits with an extra-large IPS 4K screen that provides four times the resolution of Full HD, even at wide viewing angles. Complete with the α7 Gen 2 Intelligent Processor — empowered by AI at its core to enhance images, action and color. Dolby’s image and sound technologies transform your experience. And it’s a brilliant TV that combines LG ThinQ with the voice assistance of the Google Assistant* and Alexa** to control your entertainment and smart home. Welcome home an LG UHD TV that pushes home cinema size to the extreme.